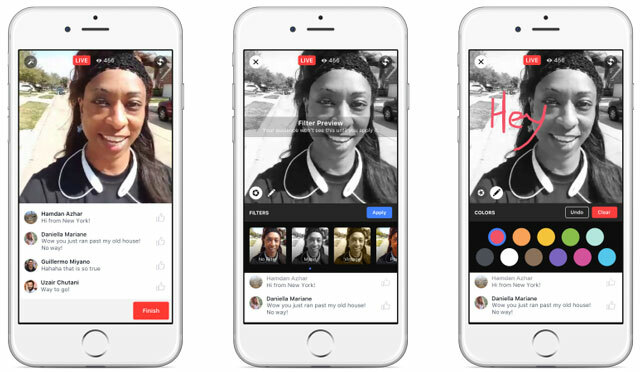 Facebook debuted its in-app live streaming service, Live Video, to everyone just a few short months ago, and they’re already adding even more new features, a press release announced today. Facebook Live was originally a way to communicate with all of the people on your Timeline, but now, you can go live in Facebook Groups and Events pages. While you could control who could see your livestream on your Timeline before, this new feature further extends that, and it’s a great privacy upgrade. Not everyone wants to see your kids’ piano recitals as they’re happening, but if you’ve got a family group, you can broadcast only to group members. And now you can show all those people who clicked “Maybe” on that event invite but didn’t show what they’re missing out on. Facebook Live Video’s new filters and reactions make the livestream more fun and open up a lot of new creative avenues that weren’t there before. The filters take a cue from Instagram and let you personalize your broadcast to black and white or sepia. And while it hasn’t been rolled out yet, Facebook said that you’ll soon be able to draw on your video during it, which is pretty similar to Snapchat. The reactions that Facebook implemented last month, which let you “haha” or “wow” rather than just “like” a post, will also make their way into Live Video. As you’re streaming, people will be able to react to whatever you’re doing in real time, throughout the video. In their statement, Facebook said their initial data shows that people comment more than 10 times more on Live Videos than regular videos, so the new reactions feature is just another way for people to interact with you and express their approval (or disapproval). If you really want your Mom to watch you lifestream making her famous chocolate chip cookies, a new invite icon will let you send a notification to any of your Facebook friends that you’re streaming. It’s a good way to make sure your besties never miss a moment. The final new feature Facebook is debuting today is a place on Facebook’s mobile app to see where people in the world are livestreaming. You’ll see all of the most popular streams, from friends and others, all in one place. On the desktop, Facebook Live Map will show you where in the world people are live streaming, and will allow you to click and watch along with them. Facebook is definitely trying to differentiate itself from the other livestreaming apps out there, and with these new features, it might just win out. If you’re annoyed with Facebook, take a look at our how-to for fixing the most common Facebook frustrations.